This 3-bedroom villa for up to 8 guests is located in Chania Region and has a private swimming pool. 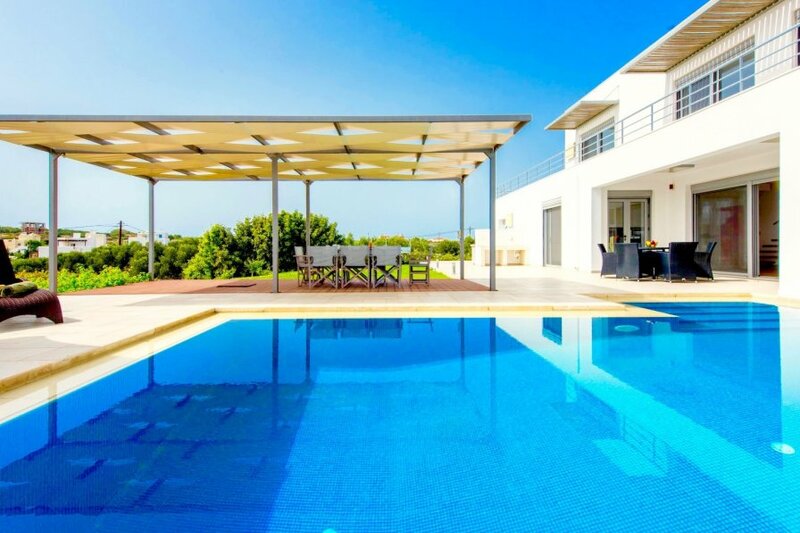 Tersanas 13 km from Chania: Very modern, luxurious villa Cleppe, 2 storeys, renovated in 2018. Above Tersanas beach, in a quiet, sunny position, 500 m from the sea, 500 m from the beach, in the countryside. Private: property 1'000 m2, beautiful garden to relax, swimming pool (40 m2, 01.04.-31.10.). Outdoor shower, garden furniture, barbecue. In the house: WiFi, central heating system, washing machine. Linen change 2 times per week. Towel change 2 times per week. Parking. Shop 5 km, supermarket 5 km, restaurant 500 m, bakery 5 km, cafe 500 m, sandy beach Tersanas 500 m. Please note: car recommended. Suitable for families, baby equipment on request (included). Cleppe, 4-room villa. Spacious and bright, very modern furnishings: living/dining room with 2 sofabeds, dining table and satellite TV (flat screen), CD-player. Exit to the swimming pool. Large kitchen (dishwasher, microwave, freezer, electric coffee machine). Exit to the garden, to the swimming pool. Bath/WC. Upper floor: 1 double bedroom with 1 double bed and air conditioning. Exit to the balcony. 1 double bedroom with 1 double bed and air conditioning. Exit to the balcony. 1 double bedroom with 2 beds, bathroom and air conditioning. Exit to the balcony. Bathroom. Comfortable furnishings in the country house style. (portable), deck chairs. Marvellous panoramic view of the sea, the mountains, the countryside and the city. Facilities: washing machine, dryer, hair dryer. At the house. Suitable for families.